On the first Saturdays of each month from November through April, The Naples Art Association features Art in the Park with original handmade artwork by member artists – about 50 artists will be there on Saturday, Nov. 3, to kick off this season’s “First Saturday” fun with at least 6 new artists joining the event for the first time. This festival, now in its 56th year, is thought to be Naples’ oldest outdoor art fair. 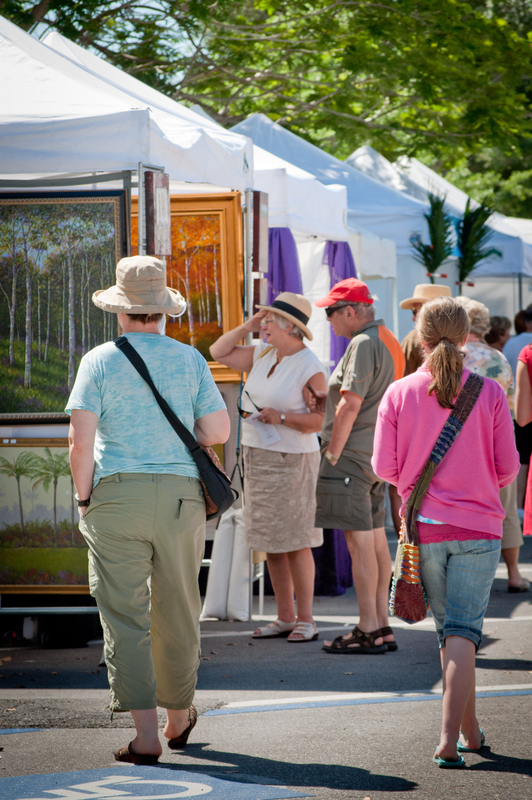 Art in the Park is a free event, with artists set up on Park Street, alongside The von Liebig Art Center, just one block from Fifth Avenue South. The art center and the art show are open from 10 a.m. to 4 p.m.
Outside, two member artists will be giving demonstrations alongside exhibiting artists. Teri Clemente has been both a professional artist and teacher for over 20 years. Teri views both teaching and painting as a joy she shares with others.The majority of her artwork consists of watercolor paintings, concentrating on the nature of beauty. Ken Andexler started creating abstract art with printers ink on paper about 12 years ago. In his art, he most appreciates the way the colors blend the inks overlay each other and form new colors. Children of all ages will love making their very own gelatin monoprints at November’s First Saturdays project at Art in the Park. Photo courtesy of Kim Walbert. Inside the art center a new art program featuring make-and-take art projects for children of all ages. The project will be changed each month and is free for families. Instructor Kim Walbert helps young artists create an easy-to-learn project. Everyone can get in touch with their creative side. This month’s project is gelatin monoprinting: it is just a little bit messy, and it’s easy to do! 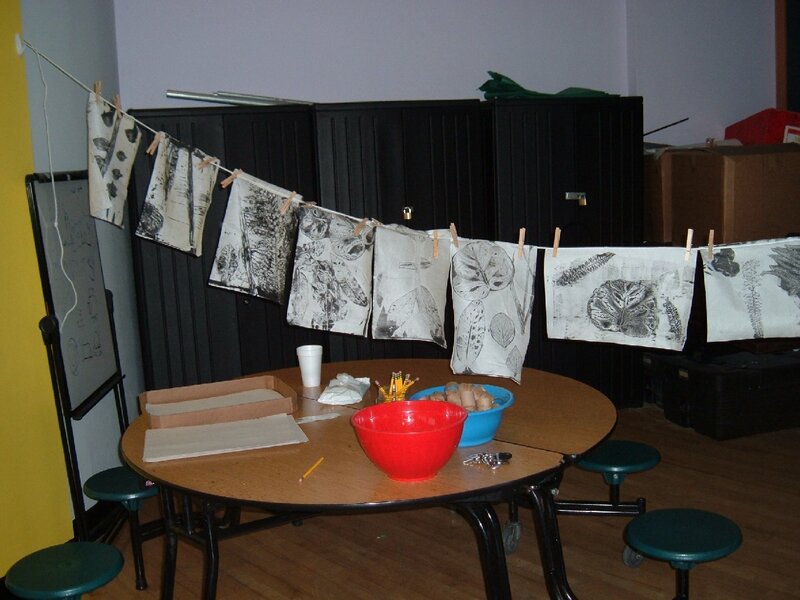 The instructor will help participants learn the process, working with printing ink, rice paper and newsprint. Attendees will also enjoy browsing the exhibitions on view indoors. Currently, the Naples Art Association Faculty Biennial 2012 and Members’ Gallery Small Works show are featured. Nearly 100 artists are represented – including 31 artists who are teaching various art classes and workshops through the NAA this season. The Naples Art Association warmly thanks its sponsors for their generous support of Art in the Park: Costco, WGCU Public Media, Florida Weekly and Happenings A&E Magazine. All activities during the First Saturdays festivities at The von Liebig Art Center are free of charge. There are activities for children of all ages throughout the entire 10 a.m. to 4 p.m. window, with the make-and-take art project held from 11 a.m. to 2 p.m. The von Liebig Art Center, located at 585 Park Street in downtown Naples (incomplete sentence). To learn more, please call 239-262-6517, visit http://naplesart.org, like us on Facebook at http://facebook.com/vonliebigartcenter or follow Twitter at http://twitter.com/vonliebigart. Dinners by Design has joined the Naples Art Association’s efforts to celebrate the artistic achievements of our community. They served up a feast for the eyes and the taste buds on Friday, Oct. 19 during the preview reception for the Faculty Biennial 2012 and Members’ Gallery Small Works Show. The next exhibition opening that they will be sponsoring is a Latin American exhibition at the art center in the spring. Enjoy these tantalizing and mouthwatering photos of the culinary art, by Avant Garde Images, from the event. 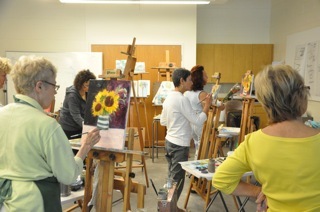 Classes at The von Liebig Art Center are taught by professional, highly-experienced instructors. The Naples Art Association provides the best art education opportunities in the area! The faculty at the Naples Art Association keeps expanding student minds and inspiring creative ideas. No matter what the genre or skill level, there’s always something new to learn. The first session of classes is already underway, but there is still a chance to claim an easel this season and get professional instruction in a variety of visual art passions. Two workshops are offered in November 2012 and Session Two classes start on Nov. 26. Classes for adults start as low as $130 for members. That’s less than $10 an hour of instruction; plus it’s a fun way to accentuate your week with creativity. Monday through Saturday, classes and workshops fill the studios at The von Liebig Art Center. For children, there’s a Saturday morning class, Clay for Kids, with instructor David Hammel. He teaches a clay class for adults too, Functional Vessels: Wheel & Hand Building on Wednesdays. Learn how to sketch and improve your drawing skills with instructor Sam Platt on Wednesdays or Saturdays. 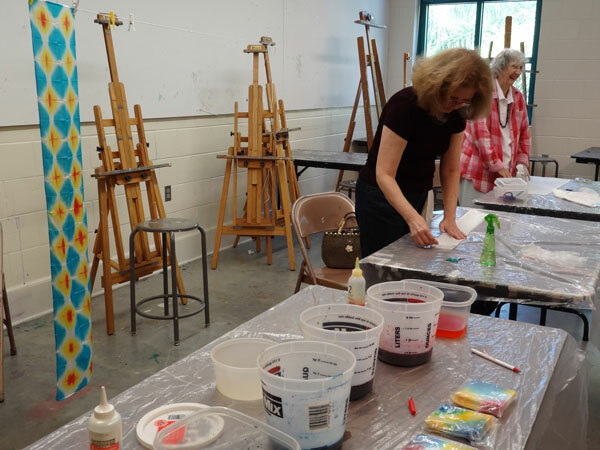 Ann Sullivan presents two classes on Mondays for all skill levels: Paint Naples and the Basics of Color and Paint the Madonna. The latter is a new class that guides students to paint classic images of the Madonna or other holiday motif to create personal holiday greetings. Additional art subjects taught during Session Two include Thinking Creatively with Multi Media (Arleen Silberstein); a new course, Papercutting Pennsylvania-Dutch Style (Mia Mazza); both Intermediate and Advanced Oil and Acrylic Painting classes (Richard Kirk, Phyllis Pransky or Marilyn Crawford); Int/Adv Watercolor and Abstract Only! classes (Genie Kell); Intermediate/Advanced Transparent Watercolor (Patty Kane) and Very Beginners Watercolor (Judy Chinski); Acrylic Landscape Painting (Sam Platt); portraiture classes (Jose Castillo or Richard Kirk); and Digital Photography & Image Editing with Photoshop Elements (John Goodlet). Workshops this month are a special treat! The first evening workshop starts on Nov. 8 from 6:30 to 9:30 p.m. with new-to-Naples instructor Anne Chaddock. Her friendly style welcomes students of all levels (even those who have never before lifted a paint brush) and takes them on a step-by-step journey to paint a mini masterpiece in about three hours. And there’s the added bonus of wine, making this the ultimate artistic opportunity to unwind after a long day at work. She’ll also offer this workshop on Dec. 6, 2012 and Jan. 17, Jan. 31, Feb. 21, Mar. 7, Apr. 4 and May 9, 2013. Each night is only $75 per student. It’s perfect for girls’ night out, date night or an affordable way to “try out” painting as a new hobby. From Nov. 19, 20 and 21, Genie Kell brings back her popular workshop, Ultimate Arting, for three full days of excitement. Intermediate to advanced students will explore the having, doing and being of art-making. It takes a group of artists, who are active but dissatisfied with their work, to a new level of appreciation of their individual talents, skills and uniqueness. When artists feel their skills are lacking, they doubt their own unique styles, they question the value of their art work or they wonder how to develop their own unique styles. This workshop turns those challenges into triumphs. All classes and workshops for this session and the entire season with the Naples Art Association at The von Liebig Art Center are available for registration on the Internet at www.NaplesArt.org. Point your mouse cursor on Education, and click on Classes or Workshops, which appear in the drop down menu. Or call (239-262-6517) or come by the art center between 10 a.m. and 4 p.m., Monday through Saturday to register by phone or in person. The crowd that gathered for the first preview reception included nearly 60 members who have been a part of the Naples Art Association for 10 years or more; they joined the staff for a champagne thank you reception in appreciation for their loyalty and support. Photo credit: Avant Garde Images. The Naples Art Association had a very busy October, as it kicked off its exciting 2012-2013 season of events, art exhibitions, classes and lectures. Before the month sneaks by us too far, let’s revisit all the fun we’ve had. On Oct. 19 at the preview reception for the NAA Faculty Biennial 2012 and the Members’ Gallery Small Works Show, we welcomed 300 guests to meet the artists, learn about different art classes we offer and discover many new pieces of artwork. Three of our member artists were surprised with awards for their artwork in the Small Works Show. It was one of many wonderful opportunities friends of the arts had to gather at The von Liebig Art Center this month. Volunteer Members’ Gallery Assistant Manager and photographer Constance Parry took photos of the winning works. See a full album of images from the preview reception, taken by Avant Garde Images, on our Facebook page. Fiber Art instructor Jean Marie Baldwin’s class, Shibori, has attracted a group of excited students who will each complete beautiful silk scarves during the 4-week course. Shibori is one of 12 classes taking place in Session One this season. Rashmi Sharma M.D. gave a lecture on Peripheral Vascular Disease on Oct. 23. 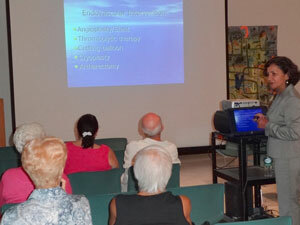 The event was the first of Physicians Regional Healthcare System’s series to be held at The von Liebig Art Center. October was the kick-off month for our educational programs, featuring 12 different classes. Partnering with Physicians Regional Healthcare System, we hosted an informative lecture, the first of several this year. Author and life coach Shelly Aristizabal hosted a book signing for “This is Your Year,” where she encouraged a crowd of about 30 people to make the most of their lives and fulfill their dreams. Artichoke and Company hosted their Welcome Back event, “Art and Wine,” with a fun and culture-loving crowd. October is almost behind us, and the schedule is only getting more exciting as the year moves along! Watch here for details and alerts about the wide variety of activities going on at The von Liebig Art Center. 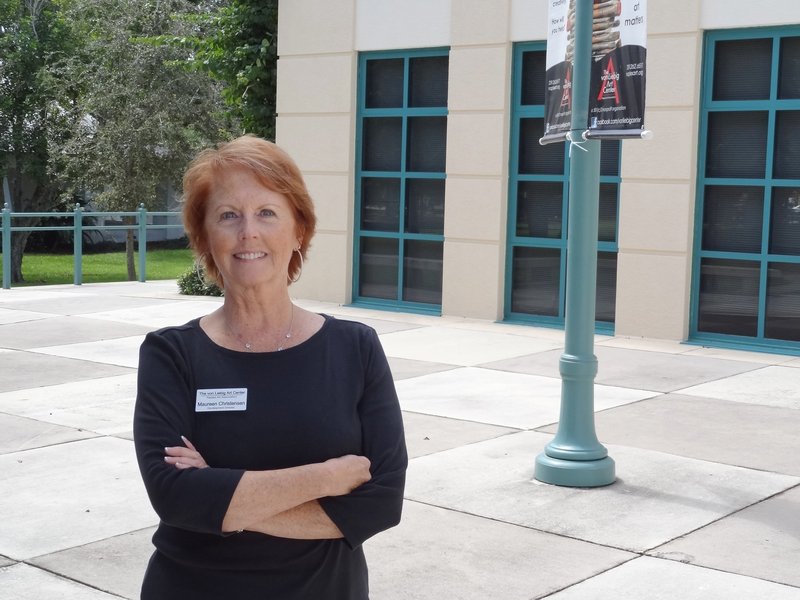 Maureen Christensen joined the Naples Art Association staff in October 2012 as the Development Director. The Naples Art Association is excited to welcome Maureen Christensen as its new Development Director. For more than 8 years, Maureen was the Director of Investor Relations for the Economic Development Council of Collier County, Inc. Most recently, she served the Greater Naples Chamber of Commerce as an independent contractor, leading the fundraising efforts for The Partnership for Collier’s Future Economy as Director of Resource Development. Maureen is a graduate of Fordham University, Lincoln Center, New York, from which she holds a B.A. in Art History and Studio Arts. In her new position with the Naples Art Association, Maureen will be working directly with business and individual supporters to help provide the needed funding for community’s benefit. She has hit the ground running from her very first day, but she took time to help us get to know her a little bit better in this quick interview. What are you most excited about in taking on this new challenge? Since moving to Naples 12 years ago from the Northeast, I had the good fortune to work with many business leaders in our community. We are also fortunate in having very talented artists residing locally who share their gifts with the community. Through their respective areas of business, these professionals are dedicated to educating the children of Collier County making Naples an even better place to work and live. The Naples Art Association at the von Liebig Art Center focuses on local talent and the education of future leaders. When you believe in the value of what you are doing and the positive impact it can have, you want to share that passion with others in the community. Why work for an artistic nonprofit? Throughout my career I have been in the nonprofit sector. This has taken many forms such as trade association management and economic development. My love of the arts and the importance that they play in creating balance and harmony locally can enhance the acknowledged quality of life that we all share. Outside of work, reading, traveling and all things related to the arts are what I most enjoy. Recently, I returned from a River Cruise on the Danube where we visited cities in Germany, Austria and Hungary. The cities in these countries have a very rich history that includes their architecture and all forms of the arts. Unfortunately, a week’s visit doesn’t allow enough time to take in as much of this culture that we would like to experience. So another opportunity to visit Vienna and Budapest with a focus on the museums, music and dance would be most welcome. What do you love about living in Naples? When people talk about the beautiful weather we enjoy, it is easy to agree and recognize our great climate and visual beauty that we’ve all come to enjoy. However, I believe that our best attributes are the people we attract from all over the country who move here and bring their talents to the place we’ve come to know as home. What would you like people to know about your passion for the arts? At an early age, my younger sister introduced me to the arts. We visited all of the well-known museums in New York, studied Shakespeare and took various visual arts courses that led me on a path to study art history and visual arts. In addition to my years in the nonprofit arena, I am able to now focus on my love of the arts and share the significant contributions that the arts make to our community through organizations such as the Naples Art Association. 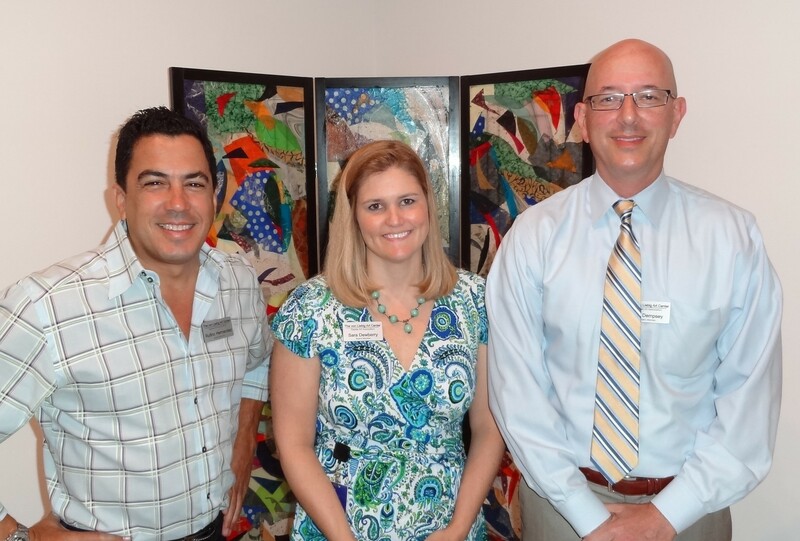 Rufino Hernandez, Sara Dewberry and Will Dempsey have joined the Naples Art Association Board of Directors. The Naples Art Association Board of Directors has added three new members to the team: Will Dempsey, Sara Dewberry and Rufino Hernandez. Board President Stacey Bulloch is thrilled that these individuals have stepped forward to get involved. “Sara, Rufino and Will have all been actively involved in the Naples community for many years, and I am excited for the valuable perspective and insight that they will bring to the Naples Art Association,” Bulloch said. With the newest additions, the association’s board includes 17 individuals. The Annual Meeting will be held on Thursday, Oct. 25 at 9 a.m. at The von Liebig Art Center, where Naples Art Association members are invited to attend and meet with the board. Will Dempsey is an attorney with Cheffy Passidomo, P.A. who shares a passion for local history and culture of Naples. Born in Italy, he has taken a renewed interest in the value of the arts in a society. “I have come to understand intuitively that art is a critical component of any healthy society, and that a child who appreciates art grows into a more creative, dynamic and sympathetic adult. I accordingly want to interest myself in raising the profile of art in our community,” Dempsey said. Just prior to joining IBERIABANK as vice president, public relations coordinator, Sara Dewberryserved as the Naples Art Association’s marketing director. “I’ve always had a positive opinion of the organization, but that experience truly gave me an opportunity to see the inner workings of the NAA,” Dewberry said. She’s especially passionate about the association’s art education opportunities. Dewberry holds bachelor’s degrees in both Studio Art and Marketing. Rufino Hernandez is managing partner of Garden District and Golden Gate Nursery, Inc. Well-known for his talent in special events planning, Hernandez says he wants to help enrich the local arts scene through his experience and perspective. “I work in the design field and I am a local Neapolitan. I love to encourage diversity and local artists,” Hernandez said. The Board of Directors of the Naples Art Association works in tandem with the staff and relies on strong individual talent to collectively accomplish the goals of the organization. The board focuses on the policies that govern the association and represents its interests within the community. The board welcomes input from the membership and encourages all members in good standing to attend the annual meeting on Oct. 25, 2012 at 9 a.m. at The von Liebig Art Center. The Naples Art Association is a 501(c)(3) nonprofit organization, founded in 1954 by local artists. Its mission is to educate and promote visual arts in Southwest Florida. Through its programs, the Naples Art Association is dedicated to serving individual artists of all ages and skill levels, along their creative journeys. Patrons and visitors are inspired to learn, discover and create. Today, the organization includes more than 1,000 members and operates The von Liebig Art Center, located at 585 Park Street in downtown Naples. The art center is open Monday through Friday, 10 a.m. to 4 p.m., Saturdays in season. For more information, please call 239-262-6517, visit http://naplesart.org , like us on Facebook at http://facebook.com/vonliebigartcenter or follow Twitter at http://twitter.com/vonliebigart. The Naples Art Association encourages the public to discover great art in Southwest Florida at two new exhibitions. They will host their first preview reception of the season on Friday, Oct. 19 at 5:30 p.m. at The von Liebig Art Center. There, guests can meet many of the NAA instructors, 30 of whom have work featured in the Naples Art Association Faculty Biennial 2012, and see the talent of member artists in the Members’ Gallery Small Works show. The von Liebig Art Center, 585 Park St.
During each even numbered year the Naples Art Association highlights the work of its talented faculty instructors. NAA Instructors have a wealth of experience, knowledge and abilities in the visual arts and in educating people of all ages and skill levels. Classes and workshops are held at The von Liebig Art Center and at off-site locations. The Naples Art Association Faculty Biennial 2012 presents work in ceramics, drawing, mixed media, painting, photography, printmaking and sculpture. In the Members’ Gallery, located in the Cuthbert Studio on the first floor of The von Liebig Art Center, NAA members are off to an exciting start with their first show of the season. The Members’ Gallery Small Works show features artwork in all different media, created by current members of the Naples Art Association. A changing panel of qualified jurors selects the works for each exhibit and chooses award winners (to be announced at the preview reception). Both exhibitions are on view Oct. 20 – Nov. 24. Art Center hours are expanding with this show to include Saturdays 10 a.m. – 4 p.m. Daily admission is free to visit the art center, but donations are graciously accepted and support the nonprofit’s mission and community programming. The association warmly thanks its generous exhibition sponsor, Physicians Regional Healthcare System. The preview reception has been generously sponsored by Dinners By Design and LaRose Designs. The exhibition can be found throughout The von Liebig Art Center.